Creating transformative optical technologies to enable an affordable, faster internet for the future. I am a life science teacher, and recently, our district adopted the new NGSS standards. This research project and lesson fit in well with the standards and with the spirit of the new standards. In my project, I improved on a technique I saw on youtube to build a cell phone spectrophotometer to view plant pigments. As part of my project, I dug into how a spectrophotometer works, I learned more about photosynthesis, and I learned a lot about light. 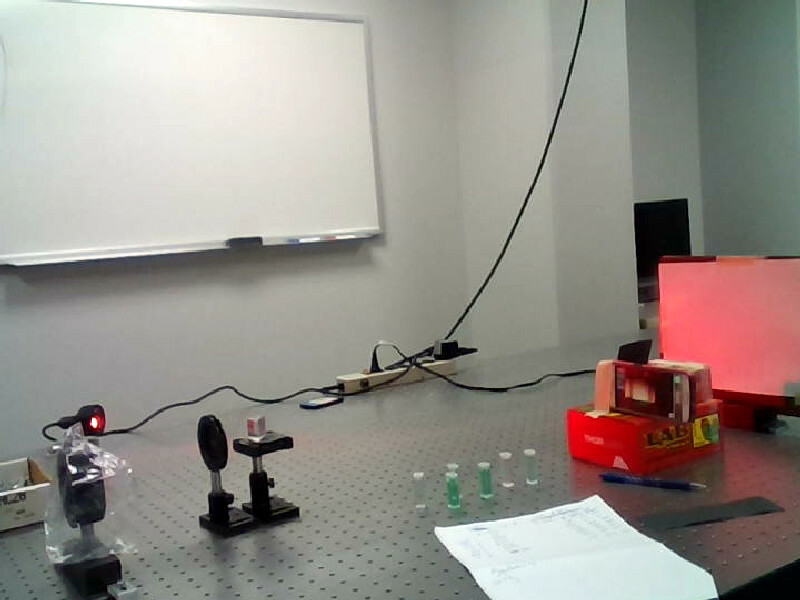 To design a better cell phone spectrophotometer, I did experiments as outlined below. Experiments were conducted in Peter Ilinyhk’s lab. A web page and YouTube video were found on how to make a spectrophotometer out of a cell phone very simply. I experimented with the idea to determine how to build one that would give the students the best results. To determine which procedure was best, I used data generated with different types of cell apps and designs for the box to create standard curves using Beer’s law to estimate known concentrations of solutions. Several tests were done as shown below, with the best results achieved using method #3. Reproduce standard curve using the exact procedure as in the video (see footnotes) using green paper and red food coloring. Graphed raw data and absorbance. Calculations were performed in Excel as follows: G value was collected directly from cell phone using paper or light as close to complementary as possible. Complementary colors have the highest peaks of absorbance. This could not be controlled with the paper experiments, but later, using the online wavelength to color relationship app, the best color can be transmitted directly through the computer screen. Absorbance was calculated by Ay = -log10(I/Io) where Ay is the absorbance of light with wavelength y and I/Io is the transmittance of the test material. Io is the intensity of the light being passed through a blank (solvent used), and I is the intensity of the light passing through the sample. For example, with the red solution, the green value of the blank was used as I0, which would be high for the blank, while the I was the green value of the red test solution, which would transmit less of the green light because it was absorbed by the red liquid. Using Beer’s law, and known concentrations of the red liquid, a standard curve could be drawn and then used to determine the accuracy of the spectrophotometer. I chose the ColorMeter Free version over about 9 other spec and colorimeter apps. This one is really easy to use. Use one of the RGB meter apps on the cell phone to get readings. Use paper to reflect light closest to complementary color of solution for peak absorbance. I then cross-checked the results using the Vernier SpectroVis spectrophotometer. I looked for a peak of absorbance and chose that value as the wavelength to focus on. It was in the green spectrum. Some issues I had with setting up the spectrophotometer: inside of the box needs to be covered in black paper, it works better that way. I simply lined the box with black construction paper. Green paper with red dye solution gave results pretty similar to the results I got with the store bought spec. Got a huge % error, but it was consistent in both store and home spec. I think I measured the solutions incorrectly. Did same experiments 2 drops per 100 ml with the same serial dilutions of 50% each time. Remade the solutions. Unknown is 333 Continue to get huge % error in both store and home. Perhaps another problem with measuring the solutions? I also only did one trial, so could have just been a sample size issue. There also seems to be a problem with the reflected light using the paper. 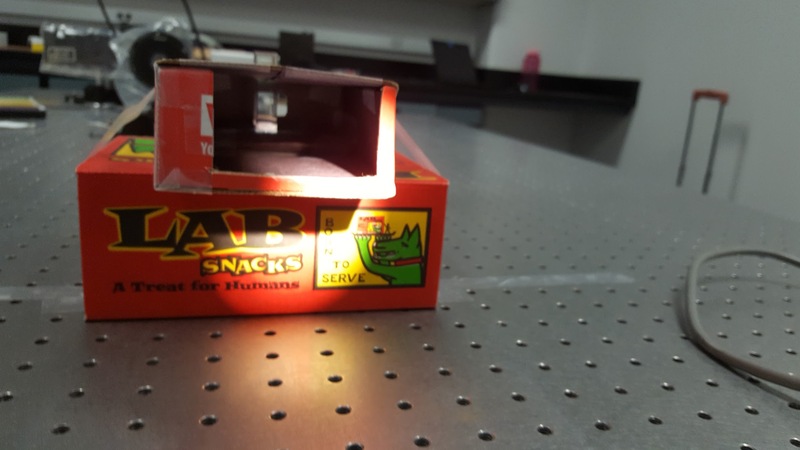 I placed transparent colored film over the outside of the boxes and used direct light to measure absorbance of red liquid using a green filter. I could not get good results with the filters. Data accuracy was poor, especially at low concentrations. Phone color meter was saturated with light. When using reflected light, there did not seem to be enough light passing through the filter to get an accurate reading. Experiment with using red light on white paper with green liquid to simulate chlorophyll. Here is set up. Also used the spectrophotometer. Method appears to work well. This was the best estimate yet and is very close to what I measured as 333 ppm. This spec measured 327 ppm! This time I took three measurements and averaged them to get my R value and used the average to calculate the absorbance. Huge improvement over the other way with paper, since the paper didn’t really look like red or green. Both store and home specs worked equally well. There is some concern that the error is too low, but nevertheless, for my purposes, I think this is the best method. I was very careful mixing solutions and this time took the average of the R values over three trials using the green solution. I like the method much better of using the red light on white paper. Seems to work very well. Store bought spec got similar results. I took three measurements of absorbance at around wavelenth 500 nm. As usual, I chose this wavelength because there was a peak of absorbance around this value with the green food coloring solutions. My improved cell phone spectrophotometer design gave good results, and the students can use this app and technique to do other types of experiments. I am very excited to have the students use their cellphones to do science, both in the classroom, and outside of it! “Use Your Smartphone as an “Absorption Spectrophotometer ….” 30 Mar. 2016, https://www.chemedx.org/blog/use-your-smartphone-absorption-spectrophotometer. Accessed 25 Jul. 2017. “Smartphone “Spectrophotometer” – YouTube.” 30 Mar. 2016, https://www.youtube.com/watch?v=LzYhyXYcs0M. Accessed 25 Jul. 2017. “How to Calculate Absorbance | Sciencing.” 24 Apr. 2017, http://sciencing.com/calculate-absorbance-2650.html. Accessed 28 Jul. 2017. Trudy Pachon teaches AP Biology, AP Environmental Science, Biotechnology, Biology, and Advanced Biology at Mount Everest Academy in SDUSD. She received her B.S. from UCSD in Biology (Evolution, Behavior, and Ecology), a M.S. from UCR in Entomology, and her Master’s in Educational Technology from Boise State University.